Limited Edition Calm and Refresh Tallow Balm - Lemon, Lavender & Peppermint. 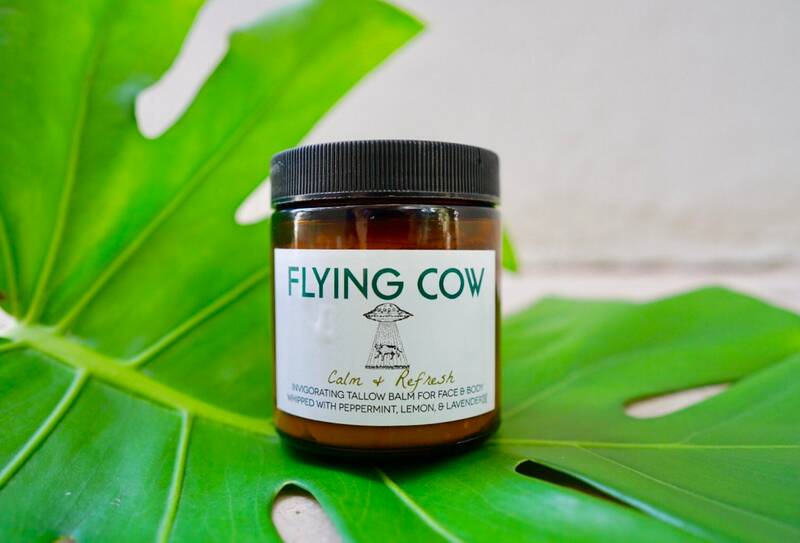 Calm and Refresh is Flying Cow's Limited Edition September Balm. Don't miss out on this classic blend. How can something so lovely and simple be so amazing. IT. JUST. IS. It's probably the first three oils most of us ever mixed together. The classic: Lemon, Lavender and Peppermint are a hard trio to resist. These three oils work synergistically to calm your skin and refresh your mind. The Lavender calms while peppermint and lemon clean and invigorate the skin & senses. This is a good balanced tallow "smell-wise" . It would do great with sensitive skin and those that love a tallow that isn't to strong, but you can definitely smell the oils come through. 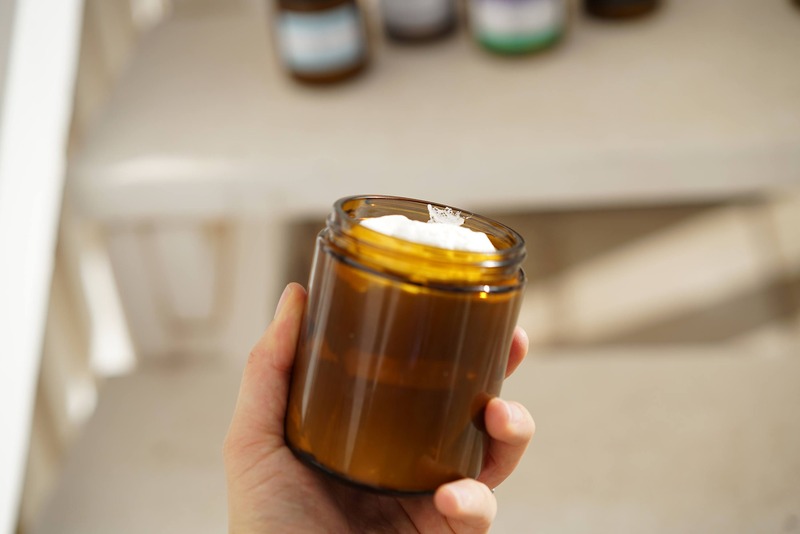 This is a great tallow for general purposes for the face and body: Dry Skin, Acne, Aging Skin, Dull Skin, Rashes, Burns, and other general skin issues. How do I use it: Apply As needed to the area. Apply sparingly to face or a lot if you prefer to let it soak in at night. 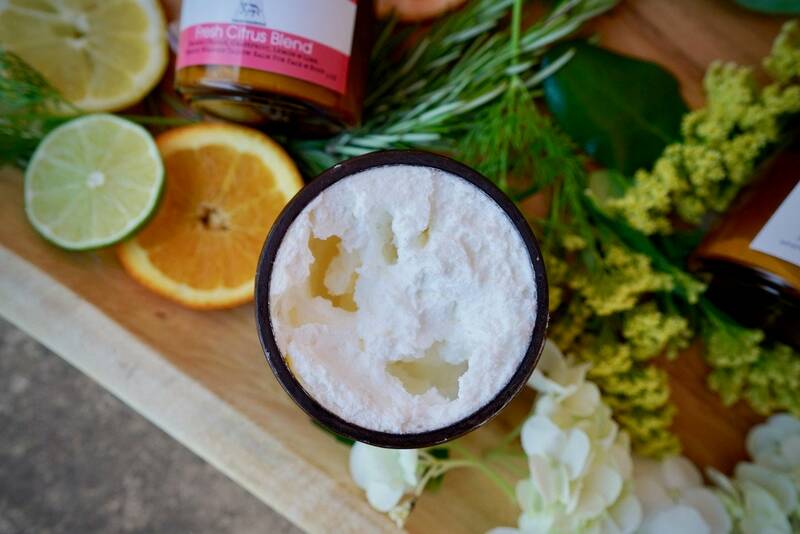 Ingredients: Handmade Tallow from Grass-Fed, Grass-Finished, Organic Tallow; and Organic, Unprocessed Coconut oil and Organic Lavender Oil; Organic Peppermint oil; Organic Lemon Oil. Tallow is animal oil that has been slowly and carefully kettle rendered from the suet of animals like cows or sheep. Our tallow is slowly kettle-rendered from organically farmed and grass-fed/finished cows. Due to the diet and care of our cows, this gives our tallow an amazing vitamin and fatty acid profile that can only be found in animal oils. There is nothing new under the sun, and that is true with tallow. Tallow was prized by generations in the past, but as chemical products became more and more popular, tallow was left behind and forgotten. Now, as people are becoming more aware of the side effects of harsh chemicals and man-made products, we find ourselves turning back to what nature had provided all along. •	Tallow is easily absorbed by your skin! •	An amazing vitamin profile- An amazing combo of vitamins A, D, E, and K that you can only find in an animal oil. Put them together with our plant oils and you have a match made in heaven. •	The AMAZING fatty acid profile- These fatty acids are found naturally in youthful and glowing skin and tend to decline as we age. o	Palmitic Acid- Protects skin from the environment and smooths. o	Omega 7 (Palmitoleic Acid)- Anti-Microbial. o	CLA- Anti- Calms inflamed skin and kills bacteria. o	Stearic Acid- found in our own oils, this amazing fatty acid brings moisture to the skin, softens, rejuvenates and has anti-inflammatory properties. Helps with collagen and elastin . o	Omega 9 (Oleic Acid)- Awesome carrier to the other oils and helps penetrate these nutrients deep into the skin. 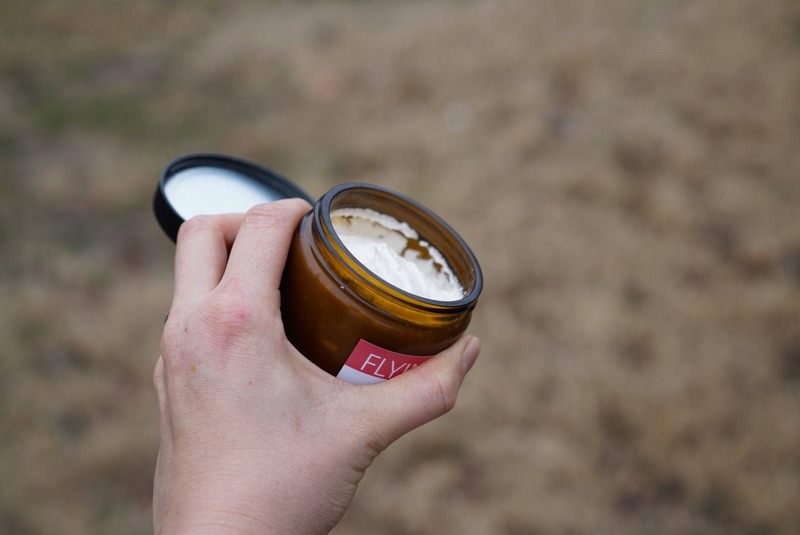 Tallow has been used for eczema, small wounds to help healing, acne, rashes, and to regain youthful skin...and much more! My name is Britney, and I am the one in the kitchen making beautiful tallow whip for Flying Cow Tallow. 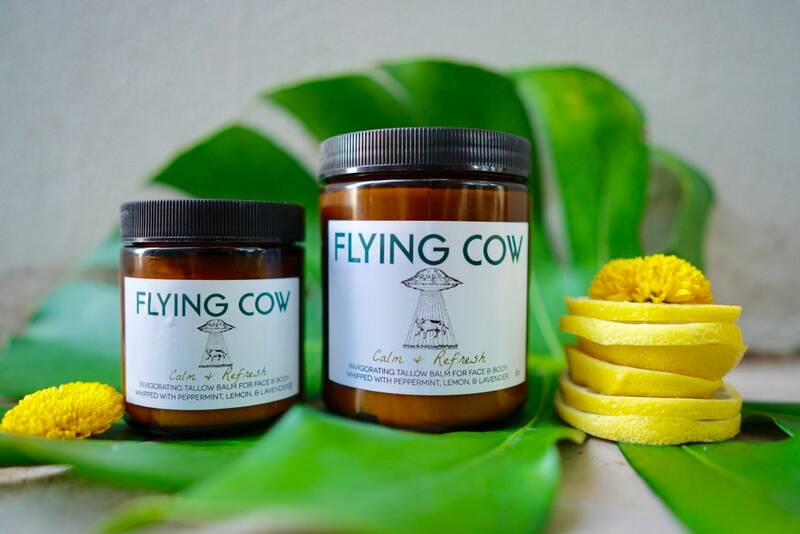 Here is my testimony of how tallow ,and for the last year...Flying Cow Tallow, has changed my skin. 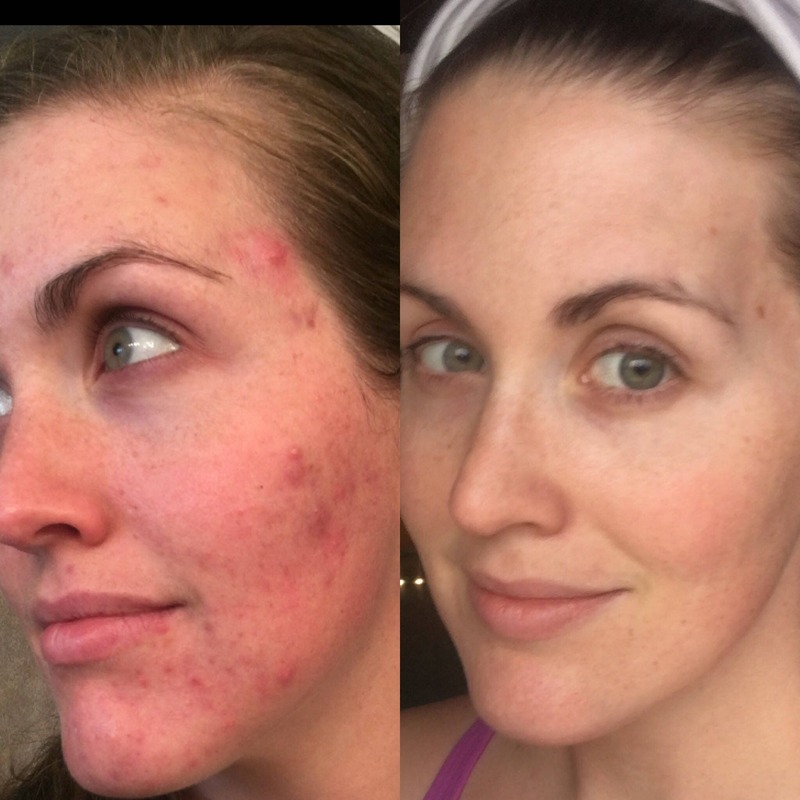 After my 4th baby, I struggled with cystic acne. Nothing helped! What the dermatologist recommended did nothing. What the lady at the fancy spa recommended did nothing! I even tried the infomercial acne kits. 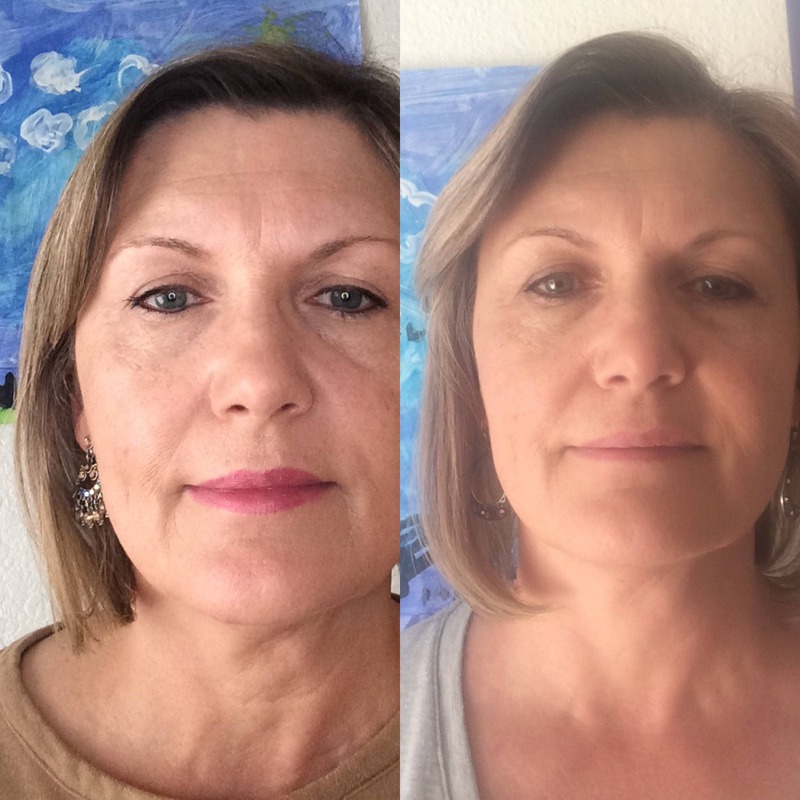 They seemed to reduce some inflammation temporarily, but then after a month or two my skin would be right back where I started. Horrible, deep, painful cystic acne all over. At my wits end, I tried tallow. It was way cheaper than other things I had tried! What did I have to lose? After a couple days, I remember my acne NOT getting worse so I continued using it. That was better than most things I had tried! One day, I realized I had less and less acne, and my skin felt so good! I got pregnant with my 5th baby and was waiting expectantly for my usual acne to return when my hormones when bananas...or, my worst fear, the cystic acne to return again. I had acne since a young teen, but it seemed to be getting worse and worse over time (even with great exercise and healthy diet and "doing all the things"). I went through the pregnancy, no acne. Now, four months post-baby (and lots of stress that usually makes my skin break out like crazy) and still my skin looks great! Its not perfect but I LOVE my skin! I know my skin loves tallow and I can see the difference so much when I look back at pictures from last year. I have tried other tallows, and my skin did well with them, but my own recipe is the best! I don't mind tallows with added olive oil, but I prefer the fluffy smooth feeling using coconut oil brings and the tingle of the organic peppermint oil. Plus, Coconut oil and essential oils are loaded with tons of benefits themselves! I have been using my own recipe for the past year (I used others for the first 6 months)...and I am so happy with it, I want to share it with my family and friends! Everything is fresh and 100% organic. This is made with a high grade, grass-fed, organic tallow. 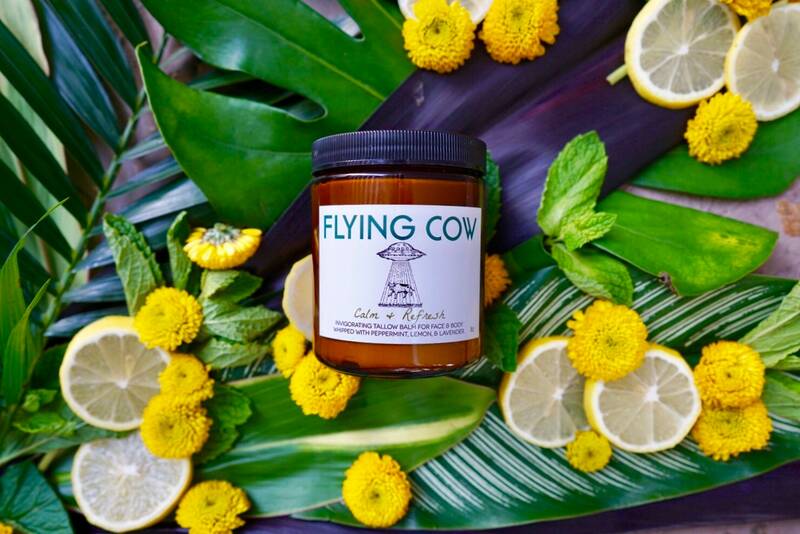 flyingcowtallow [!at] yahoo.com for questions or comments. 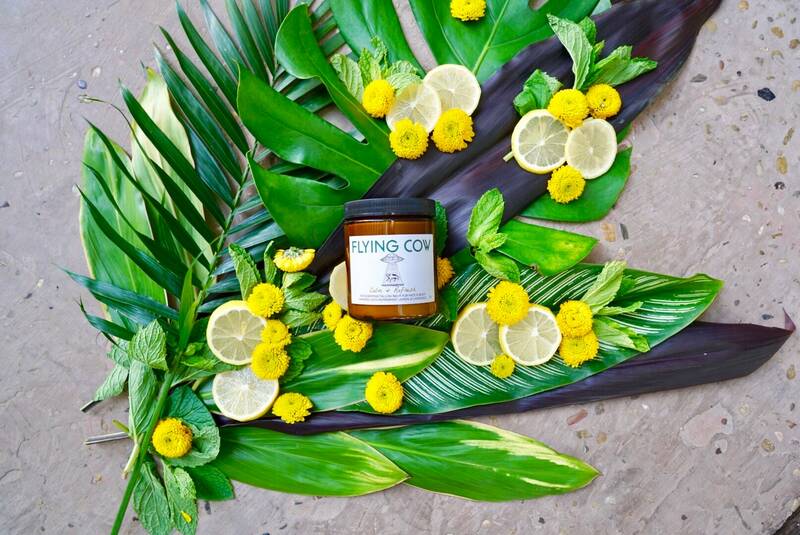 And follow @flyingcowtallow on Instagram! What is omega-9 and what does it do? The other day my husband told me my face looked great and that he couldn’t tell if I’m stressed any more. Thank You, Flying Cow, for making my skin look great even when I’m stressed!